High density mobile racking system for optimum space usage. Ideal for frozen or cold storage warehouses. Mobile pallet racking maintains direct access to all items from one single working aisle, creating a highly efficient compact warehouse with increased storage capacity. Compact mobile racking systems which eliminate access aisles, while maintaining direct access to all stored goods. Movirack is a mobile racking system in which shelving units are installed on top of laterally sliding guide bases, eliminating the usual fixed access aisles. As a high capacity storage system, it provides direct access to each pallet. An operator uses an onboard control panel or remote control to order a certain aisle to spread open. The process automatically provides direct access to specific goods stored in the chosen rack. Mobile bases are motorised, roll over guide rails and include a range of safety systems to guarantee secure, efficient operations. 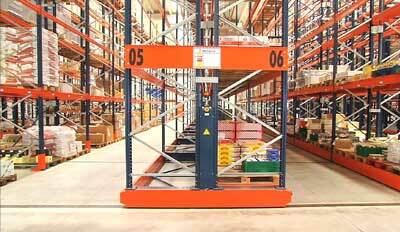 Movirack mobile pallet racking is the ideal system for cold-storage warehouses (i.e. both refrigerated warehouses and frozen storage) since it makes optimal use of temperature-controlled spaces, reducing the costs of chilling such an installation. Choose between various shelving or cantilever models.